Protect your stacked firewood from precipitation with the Panacea Vinyl Log Rack Cover. 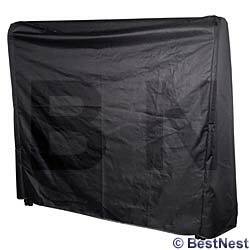 This durable, vinyl item easily drapes over your existing log rack, shielding the wood from rain and snow. Velcro tabs attached to two corners of the item ensure quick access to your firewood, without uncovering the entire pile. This 91" long, 20" deep cover fits over most 8' log racks, for a protected fuel. Keep your firewood dry with help from this Vinyl Log Rack Cover.